I can guarantee you that no-one you know has ever brewed a Dutch-style Oud Bruin. Because it’s one of the world’s most obscure beer styles. And one that the style guideline writers haven’t noticed. That said, it’s not the world’s most inspiring style. On my first trip to Holland, I can remember getting all excited in a Deventer bar when the barman told me that, in addition to the standard draught Pils, they also had a bottled dark beer. It looked the part in the glass, but I was horrified when I tasted it: thin and gum-achingly sweet. I’m not really selling the style, am I? It doesn’t have a long history. Though there was a style of beer called Oud Bruin that went back centuries (and which was closer to the Belgian style) , this type was only invented in the 1930’s. Supposedly by northern Lager brewers who wanted to wean drinkers in the south of Holland off the sweet, dark, top-fermenting beers still brewed down their way. 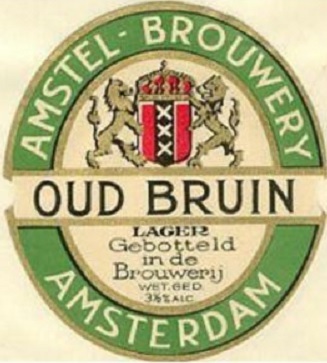 Several Lager brewers still produce Oud Bruin, but only in tiny quantities. When I wanted to buy some (for scientific purposes) the only one I could find was Heineken. I’ve heard rumours that some breweries just water down, colour and sweeten their Pils to make it, rather than brewing it from scratch. Surprisingly, it’s one the bitterest Amstel beers. Cool! It was invented in the thirties, 1935, and exactly by Amstel. Back then, it was sweetened with saccharin. I've always wondered whether they sticked to that stuff, as it had a bad name and the use of it was restricted already in 1926. So here's the answer: candy sugar in stead. Not that this would reduce any of the tooth clattering sweetness... Love your story of the Deventer trip. Oud bruin was considered as a woman's beer for a long time, and as an old women's beer even more. Nowadays it's really hidden on the farthest back or down shelves in supermarkets. Alfa, Bavaria, Brand, Grolsch, Gulpener and Lindeboom still make it too - and I don't dare saying 'brew'. The rumour of coloring and sweetening pilsner (or even residues and returns) has never been turned down. But this shows that it was brewed separately with a small part darker malt! It won't do its reputation any good I'm afraid, but a fact is a fact. "Ooo, that looks interesting. I'll try a bottle." They probably brew just enough for everyone to drink one bottle in their life.